This is the NEW FEATURES page. To keep you up to date we have decided to create a page that lists everything new that we add to the site, so you know whats going on! Keep checking this page for updates. The site was taken down today to begin the transfer to Oracle. This was a HUGE task as every call to the database had to be re-written for a new system. It went smoothly and after 24 hours the site was back up. The New edition of the NeoComix is out now. Congratulations to Jonahbliss who sent in the winning storyline. Click here to read parts 3 and 4! If you have any ideas for what should happen next send them to comix@neopets.com. The closing date for suggestions is Monday the 29th May. We updated our about us page now so you can see a little bit more about the people behind Neopets (and how scary we look). Click here to see the new version! We added a new game where you have to shoot the invading space craft and save Neopia from alien invasion. Click here to start playing! The Battle Faerie has returned to Neopia along with her trusty steed. Click here to find out more about her. Two new pets were added today. The Zafara is based on an idea sent in by Chanii1234 for the Create a Pet Contest we had. The other loveable guy is a Blumaroo designed by Anthony (one of our new artists). 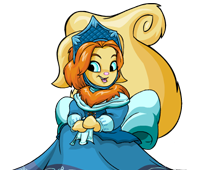 The New Neopian Beauty Contest is out. Everyone who sent in their pet picture before May 1st appears in this contest. If you sent your pic in after May 1st your entry will be in the next contest. There are some great entries including this fantastic Lupe by Gotoman7777. Click here to see the others! We made a lot of progress on the new system and it looks like we are running on time and will be ready for the big transfer this weekend. Loans have been taken off the site as they were being abused. They will not be coming back! We fixed several bugs in the Neopian auctions so now it should be a lot faster. News on our BIG CHANGEOVER! We won't be taking down the site on Saturday, but we should be doing the transfer early next week. Fixed a bug in the marketplace where it sometimes says you don't have a shop. That's fixed now! Added a new game to the Game Room - Kiko Match! Match the pairs and see how many points you can get. We are in the process of adding another hi score table to the site. Adding loads more smoothies and milkshakes! Today we added lots of New Neopets backgrounds to jazz up your desktop. To see some of the new designs click here. Now you can get an Invisible Uni and a half-n-half Fuzio. Collect the brushes now, you will be able to paint them tomorrow (We are still working on that one). Loads of smoothies added in the smoothie shop! Loads of new diseases and cures added at the Hospital. Watch out, and remember to keep your pet fit and healthy! In a couple of days the BIG CHANGEOVER will come where we move to our new faster servers. No more connection errors ever! We will have to take the site down for about 12 hours to do this, but it will be worth it. We will be in touch as we get closer to the event. Magical Paintbrushes are now lurking around the site. Grab one and go paint your pet at the Rainbow Pool. The quests now show you a picture of the item, just in case the name isn't enough! Oops! Pets weren't leaving the Neolodge. That's fixed now. Added a few more rides to the Theme Park. Sorry, we have been so busy that we haven't managed to get it completed yet. It's coming soon! We have a Neo Comic for you to read now! What??? Purple Pets? What madness is this? Too many players! The site was down for an hour or so today, we are getting Oracle in the next week so that will speed up the site dramatically. Added a brand new shop front! Added the Chocolate Factory and Bakery to the Shops list. There is a new map now to the Great Neopet Hunt. The shops list is getting way too big now, so we will be doing an image map picture for it, just like the market place. Theme parks are going to be finished soon, don't worry about that :) Just we have been so busy over the last couple of days we haven't managed to complete them. The way you change your password has been made more secure so the chance of accounts getting hacked will be less. Remember - never give out your password to ANYBODY, not even your cat! We added a new map to the Neopet Hunt, there is also an underwater one coming soon, and we will be adding random items as prizes. The Theme Parks are now nearly done. You can create your park, and loads more stuff as well... tomorrow we will have them finished 100%! Videos have started to appear in the video shop :) Collect em all! Added a warning to the notice boards, just a plea to stop people posting offensive messages and advertising. Neopets is not a dating agency! Any messages we consider to be off-topic will be removed. Any repeated swearing, soliciting or sexual descriptions will mean account deletion and also a follow-up via your ISP. This is a children's site and we will be doing our best to keep it safe. Auction bug fixed, now items won't say they are being auctioned when they aren't. The till is now MUCH faster, so you won't lose NP when taking money out of it. Removed the 'Sent Messages' folder. This means that sending the neomessages is much faster. All the pictures on the diary now work, and I have fixed the diary so it also works! Added a comprehensive Help Guide. NEW GAME!!! Its our Caption Competition. Go there now!